COMEX-Oman's premium ICT Exhibition, held annually under the patronage of the Information Technology Authority, offers access to futuristic tools, smart technologies and IT And communication solutions. COMEX - Oman's premium ICT Exhibition, held annually under the patronage of the Information Technology Authority, offers access to futuristic tools, smart technologies and IT And communication solutions. Held from 17 - 19 March 2019 at the Oman Convention And Exhibition Centre, COMEX will usher in an era of economic growth by tracking the progress of ICT in transforming companies And industries. 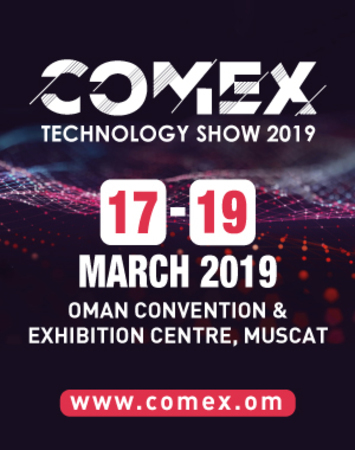 As ICT applications are being realized across several sectors in Oman, COMEX will showcase technological developments across industries related to Manufacturing, Transport And Logistics, Education, Banking And Finance, Oil And Gas and E-Commerce. The transition to a knowledge-based information society lies at the heart of Oman's Vision 2020 and development toward Vision 2040. The private sector's role in aiding this transformation will be highlighted at COMEX Business through specific focus on corporate solutions related to, Internet of Things, Blockchain Technology, Smart City, Artificial Intelligence, Augmented, Virtual And Mixed Reality, 3D Printing, Cloud Data, Cyber Security, Robotics and Machine Learning. Similarly the public sector's role in formulating citizen-consumer approaches characterized by secure connectivity And complimented by the Information Technology Authority's (ITA) digital strategy will be highlighted at COMEX eGovernment.